Happy Memorial Day, guys! For once, we have a pretty chill weekend planned–organizing the house, yard work, strawberry picking, and of course fitting in some good food and wine! I can’t remember the last day that I had off of work that I wasn’t traveling (I know, I know, poor me, ha!). So, i’m excited to sleep in and relax! Although Nick is making me do 3 days in a row of Health House classes so I probably won’t be able to walk by Monday–yikes! 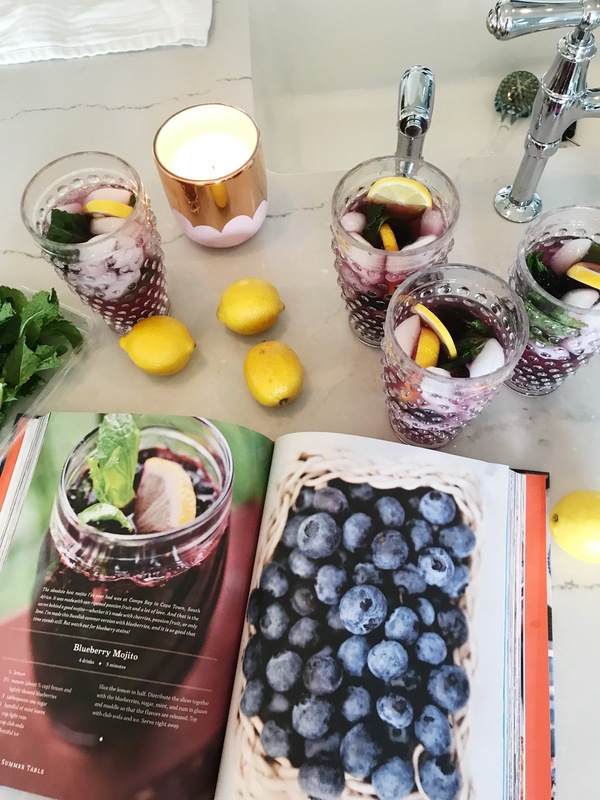 I made this blueberry mojito recipe last Friday and let me just say, it is DANGEROUS! It tastes so refreshing (not overly sweet at all), you can barely taste the rum, and it goes down alllll too quickly. Add some strawberries or raspberries and you’ve got yourself a festive drink for Memorial Day! In a large cup, fill with rum, sugar, mint, blueberries, and lemon slices. Using a muddler (I used this one) or regular spoon, smash/muddle ingredients together for about a minute.